Gold panning tour much tourist for me loved the tour on the Alaska highway. A great experience. Try to take the Gold Rush Dog sled excursion if you can! We were able to find a couple of flakes of gold. Alaska 360 was the name of the company. Alaska 360 was the name of the company. Easy and fun for kids especially - can turn your gold flakes into a keepsake. Got separated from my group and almost missed the lunch. Got separated from my group and almost missed the lunch. The gold panning was fun but they want you to buy expensive jewelry or cases to put your gold in. This was adorable and fun for our kids- we loved meeting the puppies! Ok...I thought this excursion might be a little cheesy, but we had an awesome time! Ok...I thought this excursion might be a little cheesy, but we had an awesome time! It was a lot of fun. Wanted to do it again. Recommend. Was ok for the price! Was ok for the price! Ride over was in a school bus. All you can eat salmon was good. The show put on by the country girls was funny. 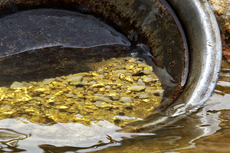 the gold panning was a learning experience. Found gold which we got to keep. Found gold which we got to keep. Played with puppies. Very fun. The actors made the experience really great. Don&apos;t forget to get the hot, fresh baked cookies. Yummy. Fun to do!! Kept our gold in a pendant! The gold panning was definitely more for kids as most adults tried for a minute or two and then left their stations. In Skagway we did go on a salmon bake and panning for gold. Gold panning didn&apos;t do a thing for me, but a lot of the people around me enjoyed it. Fun! Great breakfast; simple, beautiful hike. We had booked a 8 hour train Lake Bennett excursion but the driver left 15-20 minutes early. part of Sled Dogs, Gold Panning and 40 below. Booked the train and gold panning as a package. For us... forget it . Tailings brought in from a commercial mine many miles away. You pan them in made troughs..Maybe we were expecting too much. Thought it would be at an old mine. Oh well did find a few specks of gold. 15 mins listening to guy about panning gold and had less than 10 mins to pan 6 oz of dirt. 15 mins listening to guy about panning gold and had less than 10 mins to pan 6 oz of dirt. RIPOFF b/c kids were miserable.